Posted on April 8, 2019 April 4, 2019 , in Above Ground Pools. When you live in a country that has negative temperatures for the majority of the year and you’re asked the question, “Can above ground pools be heated?” you’re sure to be happy that the answer is “Yes.” Without extraordinarily warm summer temperatures or some way to heat your pool, you’d experience a short and chilly dip to be sure. In this article, we’ll go over a variety of ways to keep your pool warm. Water heaters allow pool owners to heat the water quickly. Although this is probably the most convenient way of heating a pool, it is also usually the most expensive. Heaters can be powered by electricity, natural gas or solar energy. Water heaters using solar energy require the installation of solar panels which are, of course, dependent on sunny conditions to work at their optimal levels. Solar mats are an energy efficient way to heat the water of small pools. The pool water is pumped into the mats which are placed on a surface that receives large amounts of sun, such as the roof of a house or garage. The water is heated by the sun before being pumped back into the pool. A similar effect can be achieved with lengths of black hose taking the place of the solar mats. Either way, this system is still dependent on sunny conditions. For those who can’t consistently rely on sunshine and don’t want the expense of water heaters, heat pumps can be used to extract heat from the air and transfer it to the water. For most heat pumps, as long as the air temperature is above 10C, they’ll still be able to generate enough heat for use in the pool. Heat pumps usually run on electricity but are much more energy efficient than water heaters. However, heat pumps don’t work that quickly and usually take a couple of days to heat a pool. Solar blankets and rings keep the heat in the pool by creating a barrier that prevents the heat from escaping. A solar blanket can be a physical barrier, such as solid or floating blankets or a chemical barrier known as a liquid blanket. Solar rings are similar to floating blankets, but rather than being composed of one continuous sheet which covers the entire pool, they’re a series of smaller discs that are easier for one person to apply and remove. Of the bunch, solid blankets are the most effective while also providing a safety factor because they don’t allow animals or small children to fall in if they decide to walk onto them. But the water must already be warm for the blanket to keep heat from escaping, so it works best combined with another system. 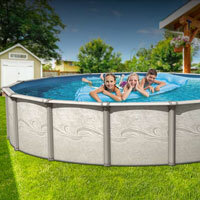 Protecting your pool from the wind will also help prevent heat loss. It’s done by erecting an enclosure around your pool. This can range from high fences or walls to a complete enclosure which allows one to swim under a protective roof. Similar to solar blankets, in the absence of plenty of sun and high temperatures, wind barriers won’t warm up a cold pool. They work best when combined with another heating method. To learn more about our above ground pool models, download a pool brochure.